Links to Minnesota's Agricultural and Horticultural insurance services and brokers: Crop, farm machinery, farm property etc. Has been a Minnesota township mutual insurance company since 1886. As a Minnesota Township Mutual, Palmyra provides fire and extended coverage for the Farm and Home to area residents and surrounding communities. We are an insurance company that contracts with skilled agents specialized in providing Farm Insurance that covers all areas of a farm's operations. 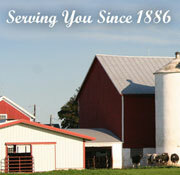 Offers both experienced agents and the top providers for farm insurance. Together we can cover all your farm insurance needs! As farms differ, so do your insurance needs and options. Whether you own a small acreage, a hobby farm or a large grain or livestock operation, we have the coverage that is right for you. Offers all types of business insurance including property, general liability, farm, commercial auto, workers compensation, bonds, inland marine coverage, umbrella's, professional liability, special events and crime coverage.